One minute you are standing, strong, and fit and able, and the next, knees buckle and you are on the ground. Confused. Shattered. Sometimes broken. It’s happened to St Kilda as a team of footy players in 2018. It happened in particular to Dylan Roberton, at age 27, when he collapsed second quarter with no one within cooee of him. (An irregular heartbeat and weeks of medical investigation to follow.) He has three kids under 6 at home. 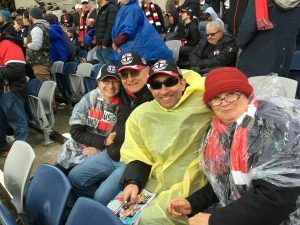 It happened to all those at GMHBA Stadium supporting the red, white and black. It happened to Dylan’s family and fans of all colours and commentators watching the game. And it happened to my older ex-partner Z. Coming back from an afternoon out, he collapsed, breaking his shoulder. Life gets turned upside down when you fall. You feel disorientated, lost momentarily, embarrassed, confused and frightened. Broken bones can be mended. There’s always next week in footy. And Dylan will work out what’s best for him and his family. Z, already deteriorating from ill health and confusion, will never be at home again. His life as he knows it has changed. It will be full time care from here on in. And the family are reeling. In already busy and stressed times, with a new baby only 7 weeks old, this falling has changed everything. Plans need to be made. Adjustments. Decisions. Back at Moorabbin, plans are being made there too. Adjustments. Decisions. Life goes on. There’s another match and another likely thrashing. Saints could fall again, or they could get up, dust themselves off, have a crack and steal a win. Who knows? 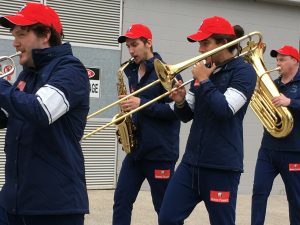 Marching Band for Geelong and Aunty Betty, Uncle Bob, Gary and me in the elements. Fans can forget the traffic chaos coming back from Geelong, with up to 90 minutes delays due to roadworks. They can forget the thrashing of the A side and be happy that the reserves/Sandringham scored a close win. They can be happy that we are back at Etihad and not placed in the uncovered Players Stand under the rain drops and in the cold. Saints fans can be happy that we are in our fortress and not the Geelong kingdom of winning-ness. Fans and players can give each other a hand to get up this weekend. In the fragility that is life, and footy, we are each other’s carers. We are each other’s other. As we hoist each other up, and stand by and support and help, we do all we can to keep upright. It’s the best that can be done. Yvette, I am enjoying these reflective and insightful reports of yours. It’s all about perspective and relevance, isn’t it, Yvette. Unfortunately, falls can indeed be detrimental as we age, and I hope Z and the family cope as well as you all would want. Sorry to hear about Z… Thinking of him and his family. I agree with you about post disorientated. It happened after I had been ran over in 2013. I felt much pain comparing to the current my fractured finger bone. Whilst Saints playing against GWS, I am playing my own footy at IMPACT Anzac Day Cup Tournament. I will be thinking of our beloved Saints while playing hard for the Dingoes. Let’s show high spirits to the Saints and Dingoes. Sorry to hear your news Yvette, no doubt the Saints will come again, they are a good young side. On we all go, Yvette. Hopefully Saturday was some small pick-me-up, Yvette. And all the best to Dylan Roberton.